These Ferrosi Knickers are right up my alley because they look like I could wear them into the woods camping and not need another pair of pants for weeks. Plus, they look like something that you could find at one of my favorite stores: REI. Of course, golfing knickers have been around since the early 1900s. Knickers, or knee pants, are short for "knickerboxer," which used to come in all different sizes. "Plus two" would extend two inches below your knee, "Plus four" four inches, and so on. 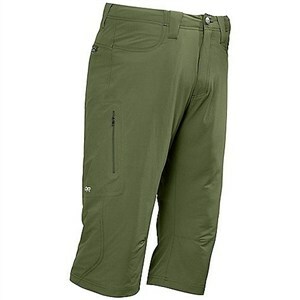 The fabric of these Ferrosis is ideal for golfing because it is wind-resistant and durable. They provide for a wide range of motion because the crotch and the knees have extra room built into them. I think the prAna Men's Nemesis Knickers are even more stylish but not quite as rugged. If you want something that looks a little more old-fashioned or retro, check out the Civia Wool Knickers. For something that looks even more dated, look at these costume golf knickers -- although I'm not a big fan of these as they aren't very practical for playing golf.